So, Weddings by Mai Atafo and BellaNaija Weddings have something for you this season. 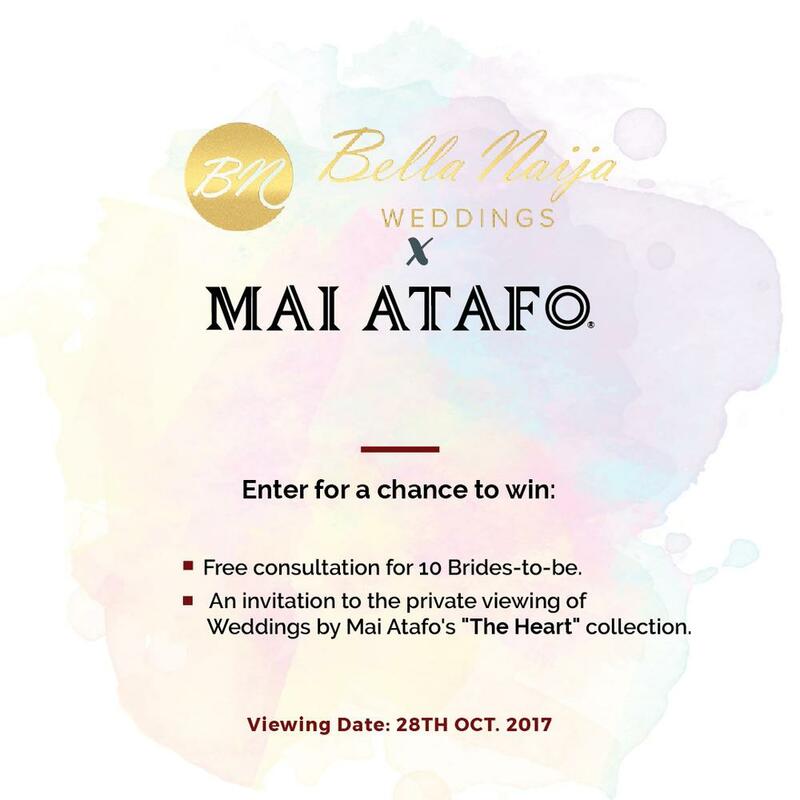 Here’s an opportunity for 10 lucky BellaNaija brides to be to have free consultation with Mai Atafo, fashion designer and creative director of Weddings by Mai Atafo. Exciting right? Not just that, the winners also get the opportunity to attend the private viewing of Weddings by Mai Atafo‘s “The Heart” collection which the brand describes as its “most exquisite collection to date”. The viewing is scheduled to hold on October 28th, 2017 by 1PM. Tell us in the comment section why you deserve to be one of the lucky brides to get the prize. Competition is for BellaNaija brides based in Lagos and available to attend the viewing this Saturday, October 28th, 2017 by 1PM. Your wedding should be taking place within the next 6 months – 1 year. Cardi B is Engaged! 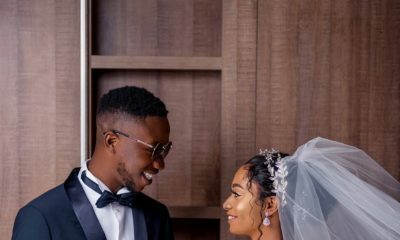 Watch as Offset puts a Ring on it ?? Wao.i have been a fan of mai atafo for a while and I have been checking out their collection which are really simple yet sophisticated and stylish.it will be a dream to be dressed in his attire ,though I always felt it would expensive but can be a reality with this collaborative effort. I’m a #BellaNaijaBrideToBe that is really hoping to be one of the selected 10 for your private viewing. As an employee in a company that caters to the needs of brides, I’ll really love to have this experience which only comes once in a lifetime. It’s amazing how you cater to the needs of brides of different shapes and sizes with diverse ideas about how their ideal dress should be. Not only do you execute these, you execute them excellently well leaving all your brides satisfied. There’s a lot of stress brides have to go through especially when it comes to finding the right dress. I’ll love to have this one stress taken off my plate. In addition, I’ll really love to see designs that never made it to the altar for reasons best known to society. 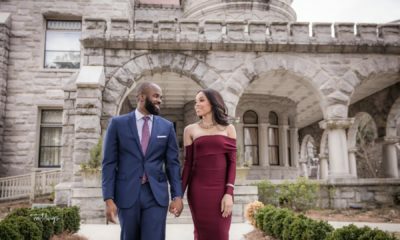 It’ll be an amazing journey into the hearts of amazing brides who dared to be different with tweaks here and there just to get their perfect dress. I know beyond doubt that being one of the selected brides will be a bonus to all the preparations on ground for my big day. I will be getting married to my best friend of 6 years and it will be exciting to have all my wedding dreams and fantasies come through. Meeting you will be amazing as well and I really look forward to it. i really want this because I just got engaged and am so overwhelmed. everyday it seems i have a new idea of what i want to look like on my wedding day and even if i cannot bring all of them to life i can at least relive this experience if i am selected. Hello,My name is Chichi and Im getting married real soon, and bae has always been about Mai Atafo dresses, i remember even talking to my mum and she was like his dresses are always so beautiful, I remember saying i would him to see me walk down the aisle in a Mai Atafo wedding dress,oh well, If wishes were horses. Please make my princessy dream come true. I just saw this post today… I know it’s late but I am really hopeful I get Picked. I know I deserve this because I love Mai Atafo’s design and wearing an outfit made by him is like a dream and me just wishing. I really hope this dream comes to pass. Hello BN!!! Better late than never…Hmm..why i deserve to be picked..?! what words can describe getting married to yourself (literally). U know this feeling of getting married to your missing rib (in biblical context) and knowing that God definitely has a hand in our union. When the bible said the bone of your bone, it meant it literally. Then on that glorious day, Im walking down the aisle looking angelic in a dress from Mai…magical! The planning of a wedding is overwhelming and everyday it gets closer with so many ideas and plans to incorporate that portrays our style and taste.. I love Mai designs for its simplistic yet modern and chic style and they exude class and sophistication. 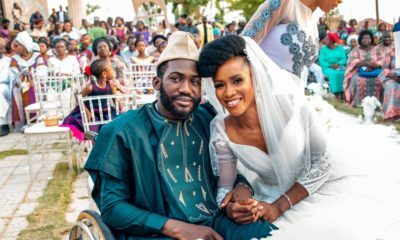 I want a simple wedding but in this latest trend and buzz on social media, its almost impossible but not completely ruled out. It would be such a great pleasure to see all my likes come together. This is so exiting as my wedding is coming up in December and i just want to Disappear. The whole hustle and bustle plus some decisions that i want to make and might just be influenced to make what others want. I have set my priorities straight but the going about these priorities are confusing. I need this for clarity, for me know and know that wedding isn’t about what who says but what makes me happy plus i need a place to disappear!!!! Help me on this as this is over me. I will be grateful and exited for this opportunity. Thank you. this is so exiting….i really need to attend this to pull out this stress and pressure. My wedding is in December and i just feel like disappearing. It seems hard but i know it isn’t . Attending this create and avenue to meet people and bring out ides for me. i am overwhelm and i need to pull off. I need this to critically pull through my priorities…please. Thank you.